Compared to many other areas of the bay, Sunnyvale’s location is one of the best. With downtown San Jose just a twenty minute drive away, access to the Caltrain and San Francisco (about an hour), Santa Cruz and its pristine beaches an hour away, and tons (seriously, tons) of hiking and wilderness parks southwest of Sunnyvale towering with California’s famed redwoods, Sunnyvale is a great community for anyone that loves the bay. But, besides what lays outside of its city limits, Sunnyvale has its own great community. Sunnyvale is recognized as an excellent place to raise a family due to its low crime rates, a highly ranked school system, a high average family income, and Sunnyvale’s great city amenities. Not only that, but Sunnyvale has a single unified Department of Public Safety where all personnel are trained as police officers, firefighters and EMT. Actually, the effort that Sunnyvale puts into maintaining its community parks and providing access to residents is noteworthy. The parks range from “mini” and “pocket” sizes to vast acreage such as Baylands Park which is over 177 acres. And just to give you an idea of what you might find at one of your neighborhood parks, the Seven Seas Park is pet-friendly and has a dog park, tennis and basketball court, a spray pool, and more. Then you have Stevens Creek which is a 100 acre nature preserve with lush trails for walking, bicycling and even commuting. Sunnyvale has also been dedicated to making environmental-friendly (bike riding) commutes to work simple as recognized by the National League of American Bicyclists. 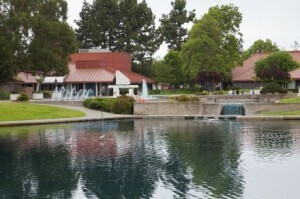 Sunnyvale has a lively community comprised mainly of professionals young and old and families where the median family income is about $120,000. As one might expect, Sunnyvale has a high cost of living compared to the national average (59% higher, in fact), however cheap apartments with all bills paid can be found if using the right apartment guide. Apartment living in Sunnyvale varies, but the majority of apartments for rent in the area have received very high ratings and reviews by our experts. With many recent apartment complex additions to Sunnyvale, there are many luxury apartments to choose from for apartment searchers. Also, there are many homes for rent for those looking for a house, but are not interested in owning. Those looking for a Sunnyvale studio apartment with utilities included will want to look towards the northern parts of Sunnyvale between South bay Freeway and W. Evelyn Avenue where the price of living is less expensive. Although this area has less of a residential feel as areas south of E. Fremont Avenue, the trade-off is a closer and very walkable location to restaurants and shopping. However, for apartment finders looking for a place within the same building as a restaurant, you should check out downtown Sunnyvale. Downtown recently went through redevelopment and is now prime for those wanting the amenities that downtowns generally have (restaurants, shopping, nightlife), but within Sunnyvale. Make sure to check out restaurants such as Dish Dash and Tarragon for some good eats. Downtown Mountain View is a cute little place to visit. Especially on a Sunday, you can shop a little in the farmers' market, then have brunch with friends, and then shop again (There is a boutique called Therapy which I loveeeeeeee). Great selection of restaurants nearby also. We have lived in Mountain View for about 3 years and just love it here!!! Nice residential neighborhood with mostly large, expensive homes. Still a doable walk downtown and being close to Embarcadero is convenient if you commute outside of Palo Alto. Great location (walking distance to bars, restaurants, cafes, and short bike ride to Stanford). Unfortunately it's really pricey - you can get more value in menlo park or Cal Ave area. Great location that is walking distance to Cal Ave. There is a solid farmers market on Sundays and Molly Stones right down the road. Only complaint is that the buildings are older but they have recently been renovated with granite and all the niceities. Biking distance to Stanford. Walking distance to Menlo Park. Great location if you can afford a place. Seale Ave and, more generally, Old Palo Alto (broadly defined as Embarcadero to Oregon and Alma to Middlefield) is an ideal spot for young families who want to be close to Stanford. It is about 1 mile to Stanford (via quiet streets and bike paths), 1/2 mile to California Ave downtown, 1 mile to Town & Country shopping area, and within 2 miles of 5-6 parks. Very little traffic due to stop signs and Bryant Ave is a great bike boulevard to PA downtown (1.5 miles). There are mature trees shading sidewalks on every street and many silicon valley who's who live nearby. For students looking to party/nightlife I would choose closer to University Ave, this is almost exclusively families/couples. Amazing place to live! Middlefield is a bit busy but overall great neighborhood. Quite area with a lot of nice restaurants in the vicinity! Bars, restaurants and more. You don't want to go live in the 'burbs - be here! Nice place to live generally. The rooms are a little sterile, but's it's new and clean and the rooms are spacious. Definitely nicer than what you'd expect from typical grad student housing. Used to live near downtown San Jose. Light rail was really convenient for me because I worked on first street which is where the light rail runs. Downtown San Jose has a bunch of bars, restaurants, cinemas etc and very lively at night. Living in Munger for the summer - super convenient when working on or near campus! Close to Campus & California Ave! Quiet residential neighborhood which is only a 12-minute bike ride to campus and offers access to restaurants/bars on California Ave. Area is a bit run-down, but prime location makes up for it. This location is incredibly convenient to Stanford (15 minute walk to the edge of campus) as well as University Ave, but also only a 10 minute drive to 101 or 280. Surrounded by beautiful homes; minimal street traffic and easy parking. It's a great neighborhood, feels super safe at all day times and really close to University Ave. Johnson Park has volleyball games on the weekends. Unlike other areas in Palo Alto, there's street cleaning so careful not to get a ticket! Beautiful and quiet tree-lined street with some amazing homes. Very close to 101, yet feels miles away. An awesome place to live for grad students. It's quiet, really close to campus, next to Ray's Grill, and has updated appliances. Munger is the premier graduate student housing on Stanford's campus. Cleanest, nicest amenities, newest. Its a bit pricey compared to the other options. (Frnly, the cost isn't quite worh it given that the other housing options are also very nice. That sais, if cost IS NOT a concern. Live in Munger. Great neighborhood - lots of families and friendly neighbors. Biking distance to Stanford and downtown Palo Alto. Stanford GSB Passdown House "BlackLight"
Great food, great value. Love the omelets. It gets crowded on Weekend mornings. You'll likely have to wait. I lived in the 725 Roble apartment buildings. They were *fine* -- management was easy to work with, property was exactly what we needed and nothing more. But the prices in Menlo have just gone through the roof lately. The area is itself is convenient, though. My partner biked to Stanford (~15 minute bike), and I either drove to work or walked to the Menlo Park Caltrain (~10 minute walk, and it gets *most* but not all trains). The Menlo Park downtown area is more cute than functional. Most things close about 9 pm, and there isn't a good bar location. Though the Safeway is close, nice, and open 24 hours. Great location right next to Stanford University. Easy to bike to Stanford and to California Ave. Housing is often smaller and older. Love the PA farmers market right across the street every Saturday morning. Parking was an issue, with only 2-hour street parking available on Forest. If you find a nice place, expect to pay a premium for it! Nice area, more of a neighborhood feel than University. Walking distance to California Ave restaurants and farmers market, biking distance to Stnaford and Downtwon Palo Alto. This location is close to all of downtown Palo Alto and Stanford which made it a very convenient and pleasant place to live...especially on summer nights, however you pay SF prices with not a ton of amenities for the location alone. Start searching early and expect to pay a premium. very short bike ride to University shops and stores and to Stanford campus. Very nice and quiet area that is well kept up. the only issues are that traffic on middlefield is relentless which makes parking and leaving annoying. Love living here. Quiet neighborhood, short walk to Safeway/Menlo Park, easy access to dog park and tennis courts. Perfect location, walking distance from Cal Ave and close to restaurants/Molly Stones. There is a really good farmer's market on Sundays. The building itself is older but the kitchen has been renovated. The units are fairly large and a good value. This building does not have a bike rack so people park bikes next to parking spots which makes it hard to park. There is also a problem with package thefts so I don't recommend having packages left at the front door (ship to work or pick it up at FedEx/UPS/get a P.O. box). Farmer's market happening every Sunday. Not the biggest market but has some pretty interesting food. Downtown mountain view has all kinds of food. Also has occasional festivals (4-5 times a year) that draws in a large crowd. There is an awesome bikepath that goes right alongside the train, connecting Churchill to University, passing by Embarcadero and the Town & Country shopping center. On the weekend, or when class isn't in session, you can get onto the high school football field or run around the track. Peers Park has tennis and basketball courts, a playground, and a giant field. Great cute little neighborhood park. Cal Ave is the mini University Ave, the "other side" of Palo Alto. Lots of cute restaurants and shops, but smaller and quieter than University. Where most of the MBA1s at Stanford live. Fun times. Munger's great if you're a stanford student. A little further away from the business school, but the spacious, new housing is well worth it. Great proximity to downtown Palo Alto for a livelier scene (or work), but it's pretty far from the freeway if you need to take 101 for your commute. College Terrace is awesome. Quirky homes and close to school and Cal Ave. Zuck used to live here, too. Unfortunately, supply is low and demand is high, so the rent is pretty high here. RentLingo is your trusted apartment finder in Sunnyvale. We hire local experts, such as former property managers and locators to anonymously tour and consistently rate and review every available place. They share their honest and unbiased perspective with you, so you know how every rental ranks in the area. Because our experts tour every property, we can offer consistent apartment ratings across every region. So unlike finding a Backpage or Craigslist rental, you can trust these apartments are verified and trustworthy: whether it's a cheap studio or a one bedroom with all utilities paid all the way up to a nice house for rent or a luxury condo.